Whether you are breastfeeding or bottle feeding your baby, the question of whether to give your baby a dream feed or not is sure to arise. Should you give them a feed before you go to sleep yourself? Or should you leave them and feed them when they wake up naturally? When I had my first baby, I was quite clueless about what to do with him (not an unusual phenomena I believe.) Sleep? Routine? Nappies? What were all these things? I read about a billion books. Well actually, after I got fed up of the baby keeping me up all night I read a billion books searching for "the answer" to getting my cherub to sleep through the night. Most Baby Books Recommend a 'Dream Feed'. Most of the books recommended a 'dream feed'. Feed the baby at about 11 o'clock, just before you go to bed, whilst the baby is still asleep so that you can get a few more hours sleep before they wake up again. As I was getting up a couple of hours (or less) after I was going to bed, it seemed like a much better idea than going to bed and having to wake up an hour or two later. 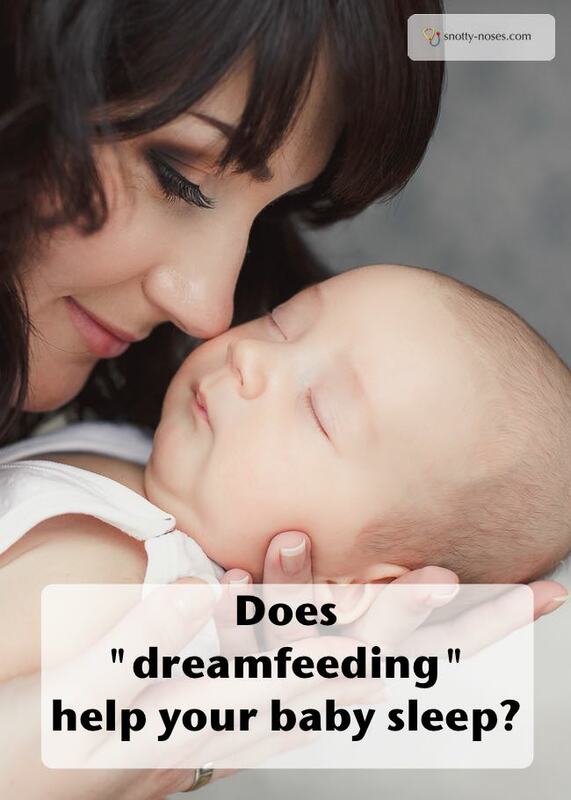 What do you do if Your Baby won't Dream Feed? Except, my baby was so fast asleep he wouldn't feed. So I'd change his nappy to wake him up a bit. It became known as the "cold water on your balls feed". But it did the trick, he fed and went back to sleep (mostly). At some stage, (not as soon as I'd hoped) we managed to get him sleeping through the night and dropping the "dream feed" wasn't too difficult. Does 'Dream Feeding' help Children Sleep through the Night? When number 2 came along, I gave him a dream feed as that was what we'd done with number 1. Now I have numbers 3 and 4 but I've changed my mind about dream feeding. I'm not so sure it's a great idea. I've heard midwives say that it reinforces a shorter sleep cycle. When in fact, what you want to be doing is stretching their sleep cycle. What about Babies teaching themselves to go back to Sleep? The theory is that if you leave the baby to sleep, they should stretch their sleep cycle sooner and thus not wake up so frequently. Anyhow, my babies 3 and 4 decided that they were always going to wake up at that time. It wasn't so much that I introduced a dream feed but rather never managed to drop it. So for the time being I'm stuck with it.